What are we worried about when people hear our accent? Are we worried we won’t be understood? Do we blame others for not listening hard enough? Or, are we worried we won’t be taken seriously, and that the conversation will quickly descend into a discussion about your interlocutor’s high school French from 20 years ago – “la plume est sur la table”? Regardless of your concern around your pronunciation, it clearly is an interruption in your ability to communicate as clearly as you’d like and to connect genuinely with the other party on the issue at hand. English For French (E4F), Australiance partner gives you 3 tips to improve your pronunciation if you feel that your accent sounds a bit too French. 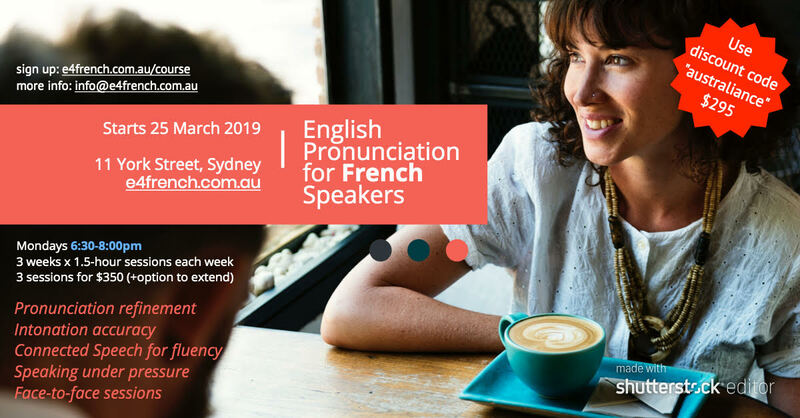 You will find at the end of the article the next event of E4F: “English pronunciation for French speakers” to get further help from experienced professionals. The French language is typically quite flat in its intonation and it might be helpful to know that when I speak French, as a native English speaker, I start to feel like I’m pumping out words and syllables with the rhythm of a machine gun. I’ve been assured by some of my most critical French native speakers friends that it sounds just fine. From the reverse perspective, it’s very strange for many French native-speakers to put that English intonation into your sentences, and when I hear my students experiment with that, there’s something in me that clicks and makes me feel instinctively closer to them. Mimic a short passage in a Ted Talk or your favourite British series (I’ve been told it’s more effective to mimic British accents rather than Australian accents – go figure!). This is closely followed by the syllable stress. Most French speakers give almost equal weighting to all syllables; however, to the English ear, the difference is experienced as placing the stress in exactly the wrong position, and this can be quite distracting and hence your message is lost. e.g. in-to-NA-tion – 3 (your ear will become increasingly attuned to previously unheard patterns occurring around you each day). In French, we have ‘la liaison’, and, to many people’s surprise, it occurs in English too. This can get quite complex, but generally speaking, French native-speakers can benefit greatly from closing the gap between their words. When a word starts with a vowel and the previous word ends with a consonant, drag the consonant across e.g. “As idle as a painted ship, upon a painted ocean” becomes – a zide la zah painted shi pupo na painte docean. If you’d like to practice these skill and get feedback on your pronunciation in fun and friendly sessions, come and join us at English Pronunciation for French Speakers. If these 3 tips were useful to you, Australiance recommends you sign up to this upcoming course. It will be run by Leonie Tillman, a highly qualified English as a Second Language (ESL) trainer and an experienced coach working to unify multinational teams. With her experience in driving French speakers to improve their accents and become more confident and competent communicators, you will finally improve to the level you need for working as a professional in Australia and beyond.